In the unfathomable darkness of the deep-sea, most creatures wouldn’t look out of place in your nightmares. Huge pointed teeth, massive menacing eyes and some with the ability to glow in the dark, it’s Halloween all year round down here. It’s not the fish or even the sharks that are the most terrifying creature down here though. It’s a barnacle. This isn’t any old barnacle though. This barnacle burrows into the flesh of deep-sea sharks, leeching all it needs from the blood of its victims. The barnacle is Anelasma squalicola and was in fact first described by Charles Darwin in his 1851 magnum opus. Most barnacles latch onto the hard surfaces of rocks and extend long appendages into the water column to feed on floating nutrients. Some barnacles even attach onto the bodies of whales and turtles, but still adopt this conventional filter feeding method. This barnacle has evolved a rather gruesome way to feed. Instead of extending an apparatus into the water column, this barnacle embeds a branching organ, called a peduncle (“pd” in above image), deep within the flesh of the shark. Once locked on, the barnacle will remain and grow for the duration of the sharks life, feeding off its blood and nutrients. This is actually the only barnacle that we know that does this to vertebrates. A recent review of this shark eating barnacle can be found here. The parasite also appears to be able to bypass the immune system of its host. With no inflammation or infection around the attachment, it appears these sharks are almost oblivious to their repugnant passengers….unless they’re burrowing the eye ball out of course. On my latest cruise, about 20-30% of all black dogfish (Centroscyllium fabricii) and 10% of the greater lantern shark (Etmopterus princeps) were infested with this parasitic barnacle. 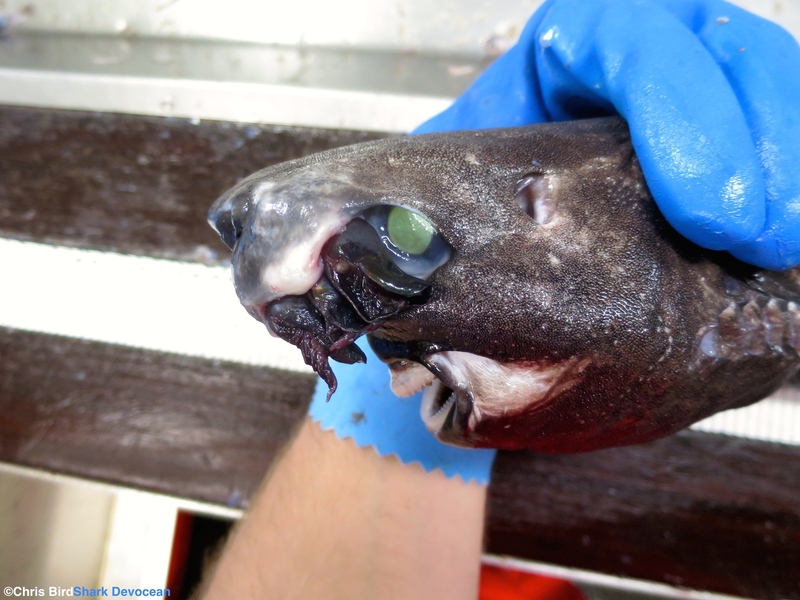 Bulging out of their skin and eyes, these parasites have clearly found developed a taste for deep-sea sharks. You may notice from the pictures of the “black” dogfish, they actually looks very white. This is due to it having very delicate dermal denticles. When these sharks are caught in fishing nets, they often loose their dermal denticles, exposing their white skin underneath. Most deep-sea sharks have very tough, coarse dermal denticles but the fragility of these two species may be how these barnacles are able to infest their tails, fins, gills, skin and even eye sockets. So during this Halloween as we approach winter, don’t be too worried about catching the common cold or flu. Just be thankful that you are not a deep-sea shark, having to worry about a lifetime infection from a flesh-hungry barnacle. OMG! These barnacles are horrible. They are something about whom Spielberg should made another sea-terror movie like “Jaws”. I love these barnacles! Such an amazing adaptation to like in the deep sea!